This, my friends, is it. This is one of those bread recipes you wait your whole life for. This is a bread recipe to take home to meet your parents. I’m not even joking. This bread is crisp-crusted, and achingly soft inside. It has air pockets that will laugh at you if you try to top a slice with anything not completely solid. It has a flavor so well-balanced that other breads cringe in its presence. There is very little hyperbole here. Ciabatta originated in the Lake Como area of Italy, a supremely gorgeous bit of the world, known as well for its topographical beauty as its leisurely pace of life. Here, one doesn’t stop and smell the roses, so much as talk to the man who grew the roses, and then taste something his cousin made with the edible rose petals, all over a glass of his father-in-law’s wine (didn’t you know they plant roses in the vineyards?). No wonder, then, that such an incredibly delicious and easy bread came from this region. It takes time, yes; but is almost ridiculously easy to make, and rewards your minimal efforts with top-quality flavor. Who out there has seen the New York Times’ No-Knead Bread? Well, this is its first cousin: the no-knead, but-you-still-have-to-fold-it-a-few-times-and-then-shape-it-a-little, but-omg-it’s-so-easy bread. Ciabatta has become very well known in the USA in the last several years, and for good reason – it is not only extremely tasty, but also surprisingly simple to make. Personally, I think its ease in creating is a major reason so many restaurants have begun serving it. It can technically be classified as a flatbread, not only due to its shape, but also to its simple ingredients and method of preparation. Sliced in half horizontally, you can load it with any number of ingredients, brush it with olive oil, and press it in a hot grill to get a thoroughly authentic panino. Don’t have a panini press? Use your waffle iron; or just use a hot cast iron pan, and smush it down with a spatula. Close enough! Alternatively, if you don’t want to make a loaf of proper ciabatta (though why you’d want that, I’ll never know), you can use the dough to make a fabulous pizza, by stretching it into a thin round, and topping as desired. Or you could even bake it in a cake pan to make a sort of focaccia; just be sure to give it the characteristic finger-pokes, and topping of olive oil and any other flavorings. But honestly, this recipe produces such a stunning loaf of bread that I can’t really see mucking about with the method, or the ingredients. I love that you don’t need any specialty equipment, other than a large bowl, and a couple of baking sheets. A baking stone is ideal, yes, but please don’t let a lack thereof stop you from making this. Even if the texture is a little off, your bread will still be extremely tasty. Yes, you’ll have to plan ahead a bit. But trust me, it’s absolutely worth it. Try making this one bread, and you’ll wonder just exactly why you’ve never done it before. 1. To make the poolish, in a bowl large enough to hold both the poolish and the bread dough mixture once it expands, dissolve the yeast in the water. Stir in the flour by hand. Cover with plastic wrap and let stand at room temperature for 15 to 24 hours. 2. To make the dough, dissolve the yeast in the water. Add the dissolved yeast to the poolish in the bowl. Mix by hand until combined. Mix in the salt. Gradually add the cake flour and bread flour and continue mixing by hand until the flour is well incorporated. The dough will be very wet and sticky. Do not work the dough, just mix until blended. 3. Let the dough proof in the bowl at room temperature for approximately 1 hour; it should double in size. 4. With the dough still in the bowl, flour a spatula (preferably silicone, or other nonstick material) and gently scraping up the dough from the outside, fold the 2 opposite sides in toward the center. Repeat, this time folding from the other 2 sides toward the center. Cover and proof for 30 mintues. 5. Fold all four sides in again, as in the previous step. Cover and proof for 30 minutes. 6. Prepare a baking sheet by lining with parchment paper and sprinkling the paper heavily with cornmeal. Preheat the oven to 425º F. If you have a baking stone, make sure it’s in the oven. If not, then if it is possible for you to bake on the floor of your oven, move the racks accordingly. If none of these is the case, then your baking sheet will do just fine, but you will need to preheat it with the oven (see note #2 below). 7. Turn the dough out onto a heavily floured surface. Be sure to use enough flour to keep the dough from sticking. Using your hands, carefully stretch the dough into a rectangle. The dough will be very sticky and full of air bubbles; be careful not to release the air as you shape the dough. 8. If only making one loaf, flour your hands, and gently move the dough to the prepared baking sheet, taking care to shape the dough into an oblong shape. If making two loaves, dip a pastry wheel or a knife into water and cut the dough rectangle crosswise into equal pieces. Gently pull the pieces apart and flour all of the sides, including the cut ends. Flour your hands and lift the pieces, one at a time, stretching them lengthwise, and place them on the prepared baking sheet. 9. Cover the ciabatta with floured kitchen towels (not terry cloth), or dust the loaves liberally with flour and cover with plastic wrap. Let proof in a warm location until doubled in size, approximately 30 minutes. 10. Uncover and spray the dough liberally with water. Make sure the parchment paper will move easily off the baking sheet. Transfer the loaves directly to the baking stone, the oven floor, or a preheated sheet pan, by sliding the parchment off the baking sheet in one quick motion. 11. Bake for 15 minutes, quickly spraying the loaves every 4 or 5 minutes. Bake for an additional 20 minutes, or until the ciabatta are golden brown and baked through. Cool on a rack before slicing. 1. 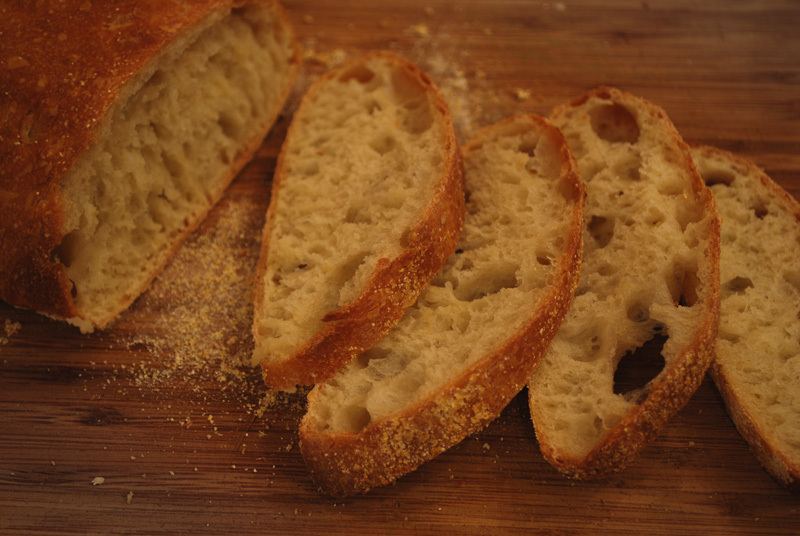 Ciabatta tastes best if it is eaten within the first 3 or 4 hours after baking (and absolutely should be enjoyed the first day it is baked). Freeze any bread that will not be eaten within 24 hours. The texture will still be acceptable, though not as good. 2. The oven should be preheated for at least 1 hour (especially if you are using a baking stone). If you do not have a baking stone, or are unable to use the oven floor for baking, heat the baking pans while preheating the oven before placing the loaves on them. Move quickly when transferring the dough – immediate direct heat is needed for the best results. 3. Only have rimmed baking sheets? Just turn one over, and slide the dough off the backside of that one, onto the waiting preheated baking sheet in the oven. Only have one baking sheet? Use a couple of large, flat plates; or better yet, use that pizza box languishing away in your fridge (or by the trash; just cover it with aluminum foil first). 4. I think this recipe works best for making 2 loaves of bread. They’re easier to move around than one big loaf would be; plus, you can serve one to company, and keep the other sliced in the freezer for yourself! Trust me, you’ll want it! 5. If you don’t have cake and bread flour, you can use all-purpose flour; although you will get the best results from using the combination. Use 2 2/3 cups all-purpose flour, or just under 12 ounces. 6. I always recommend weighing your flour out if possible; if that’s not possible, add the flour a little bit at a time, until enough is absorbed by the water.